. This two piece injection molded helmet has a high gloss finish and smoked plastic lenses over the eyes, so you can see the Jedi, but the Jedi cannot see you. The helmet protrudes from the sides and around the mouth with authentic detailing to give this helmet a true movie quality look. 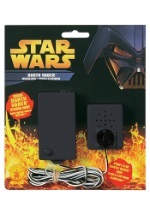 See our Darth Vader costume accessories to add a Darth Vader Breathing box and lightsaber.